I got a question about this setup on twitter and I thought I’d explain this is in a blog post instead of 140 char twitter messages (which is a pain). We do quite a lot of metrics in our apps, which are nice for debugging and seeing what is going on. 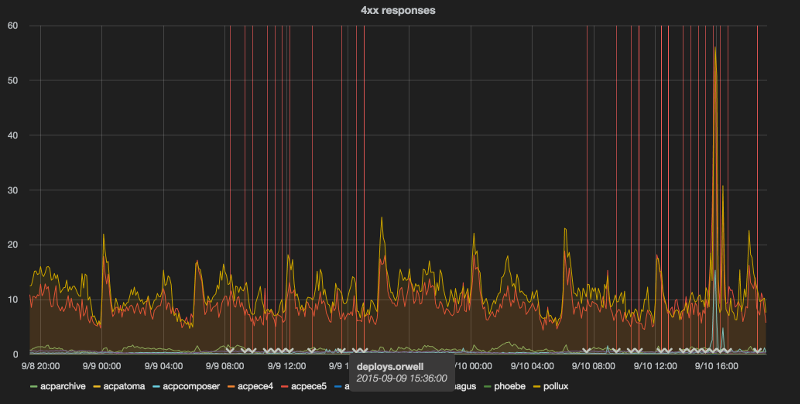 But one thing we have found very handy is to see when deploys to production happen (and they can happen up to 5-10 times a day in various apps, so without a graph it can be very hard to see which deploy made the response time shoot through the roof, or the rate of 500 errors skyrocket. We use graphite to collect the metrics which are most often sent via the dropwizard metrics framework (which is excellent) and Grafana to present pretty graph dashboards to the user. Where NAME is the app name, the value sent is 1 and then the timestamp. For more info about our metrics appproach, see my earlier post on the subject.